Aluminium pump housings entering the Turbex machine for cleaning. Mark McFall inspects a previously cleaned component. The company has increased the number of housings and other components being manufactured at its UK operation where it specializes in the development and manufacture of oil, water and fuel pumps used in diesel engines for heavy vehicles and off-road plant. 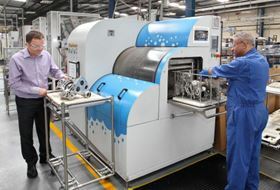 As a result, it has bought three Mafac Elba aqueous cleaning machines from Turbex which will be used to remove swarf and cutting oil residue. Mark McFall, manufacturing engineering manager, said, “Our pump housings in particular tend to have complicated shapes, so swarf becomes trapped and can be difficult to remove. Mr McFall added that cycles are shorter and the machines are smaller, meaning they can fit into limited space on the shop floor. The process chamber of the machines allows up to two pump housings to be cleaned or a large number of smaller components with the wash and drying cycle taking less than four minutes.